Sebastian Vettel won the Australian Grand Prix in Melbourne, for Ferrari. Polesitter Lewis Hamilton finished second, 5.036 seconds behind in his Mercedes, while Kimi Raikkonen finished third in his Ferrari, 6.309 seconds behind the winner. The win was Vettel’s 47th career victory and 100th podium finish in his 199th career start. It is Ferrari’s 230th victory. Daniel Ricciardo (7.069s) finished just off the podium in his Red Bull-Renault in fourth place, followed by Fernando Alonso (27.886s) in his McLaren-Renault in fifth place, Max Verstappen (28.945s) in the second Red Bull was sixth, Nico Hulkenberg (32.671s) was seventh in his Renault, Valtteri Bottas (34.339s) was eighth in his Mercedes, Stoffel Vandoorne (34.921s) was ninth in the McLaren, while Carlos Sainz (45.722s) was in the final points position, in tenth in his Renault. Before the start, the weather was clear, but windy, with a head-wind down the main straight into corner one - Lewis Hamilton on the pole alongside Kimi Raikkonen. 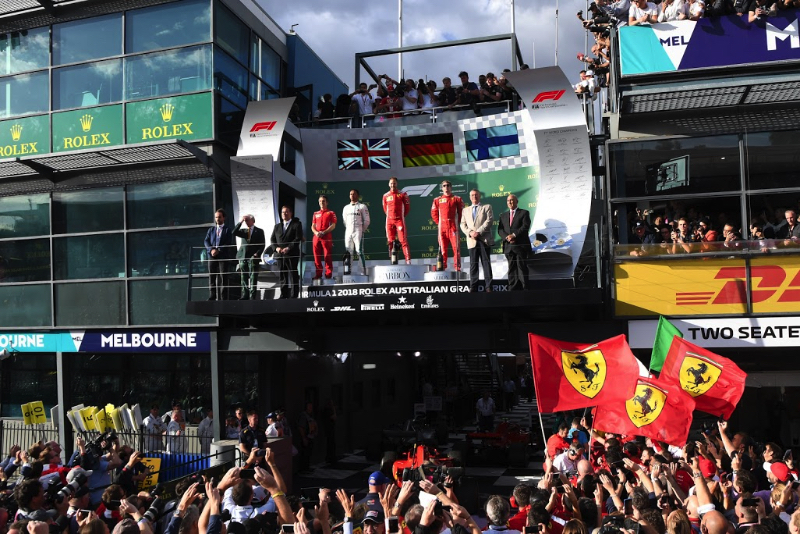 Sebastian Vettel and Max Verstappen on row two, Kevin Magnussen and Romain Grosjean fill the Haas row three, Nico Hulkenberg and Daniel Ricciardo on row four, and Carlos Sainz and Fernando Alonso rounding out the top ten. Soft, supersoft and ultrasoft tyres on offer. The start time for 2018 has changed to 10 minutes after the hour. At the appointed time the grid cleared and the cars made their way around to the starting grid, the lights when out and the first race of 2018 began with Hamilton taking the lead, followed by Raikkonen and Vettel - Magnussen passes Verstappen into the first corner. Raikkonen challenging for the lead in turn 3. Alonso tries to pass Sainz on the outside, but can’t make it stick. Hartley pits for soft tyres at the end of the first lap. At lap 1 Hamilton leads Raikkonen, Vettel, Magnussen, Verstappen, Grosjean, Hulkenberg, Ricciardo, Sainz and Alonso in tenth place. Red Bull tells Verstappen to try to find a way past Magnussen - Verstappen and Ricciardo the only front runners to start on supersoft tyres. On lap 4 Hamilton sets fast lap at 129.473s. Force India tells Perez that his rear tyres are getting warm. Ricciardo goes around the outside of Hulkenberg for seveth place. Sergey Sirotkin pulls over to a stop at tuen 13 with an apparant btake problem - the yellow flags are out. Ericsson retires in the pits on lap 7 with a power steering issue. Bottas passes Ocon for 13th place. Hamilton sets another fast lap at 1m29.070s. On lap 10 Vettel sets fast lap at 1m28.665s. At lap 10 Hamilton leads Raikkonen by 2.2s, followed by Vettel (4.2s), Magnussen (14.4s), Grosjean (16.4s), Ricciardo (17.2s), Hulkenberg (19.2s), Verstappen (21.7s), Sainz (23.3s) and Alonso (25.1s) in tenth place. On lap 11 Raikkonen sets fast lap at 1m28.465s, followed the next lap by Hamilton at 1m28.329s. Verstappen complains that his tyres are still getting too hot. On lap 15 Gasly pulls into the pits with his car smoking and retires. Ricciardo wonders if they should attempt another plan - he is running sixth right behind Grosjean. On lap 17 Raikkonen sets fast lap, and then Hamilton goes faster again the next lap with a 1m27.753s. On lap 18 Raikkonen pits for soft tyres, and rejoins in third. On the next lap Hamilton pits from the lead for soft tyres and rejoins ahead of Raikkonen - Vettel takes the lead. Magnussen, Grosjean and Ricciardo battle for fourth place. At lap 20 Vettel leads Hamilton by 12.5s, followed by Raikkonen (17.9s), Magnussen (24.3s), Grosjean (25.7s), Ricciardo (26.5s) in sixth place. Sainz goes off track but rejoins losing a spot to Alonso - he then pits for soft tyres. On lap 23 Magnussen, after pitting, pulls off the track with a loose rear tyre. On lap 24 Grosjean pits from fourth and rejoins in 11th - Grosjean pulls off the track as well - Haas has both cars out within two laps. The virtual safety car comes out - Vettel immediately pits for soft tyres and rejoins just ahead of Hamilton in the lead. At lap 26 Vettel leads ahead of Hamilton, Raikkonen, Ricciardo, Verstappen, Alonso, Hulkenberg, Vandoorne, Bottas, Sainz in tenth, Perez, Ocon, Stroll, Leclerc, and Hartley in 15th. On lap 27 the safety car is deployed. The team responds, “negative, Lewis, we thought we were safe but there’s obviously something wrong." At half way point the field is under a safety car. Alonso is waved past Verstappen into 5th - Verstappen have passing under yellow. On lap 31 the race resumes, Bottas trying to pass Vandoorne for eighthm but not pulling in off. Hamilton trails Vettel by 0.7s. Both Haas cars are being investigated for unsafe release. On lap 34 Vettel sets fast lap at 1m27.559s, the next lap Hamilton goes quicker at 1m26,043s, and is under a second behind Vettel. Bottas passes Vandoorne for eighth. Mercedes tells Hamilton that his engine is running hot, and he needs to lift and coast more. Hamilton says that there is a lot of “liquid” coming from the back of Vettel’s Ferrari. Ricciardo is challenging Raikkonen for third place. On lap 39 Hamilton sets fast lap at 1m26.889s. On lap 40 Hamilton sets fast lap at 1m26.880s. At lap 40 Vettel leads Hamilton by 0.8s, followed by Raikkonen (5.9s), Ricciardo (6.9s), Alonso (16.8s), Verstappen (17.7s), Hulkenberg (19.3s), Bottas (20.2s), Vandoorne (22.7s) and Sainz (25.9s) in tenth place. Hamilton sets another fast lap at 1m26.843s. Hamilton is within DRS range. Verstappen is chasing Alonso for fifth place. On lap 45 Vettel sets fast lap at 1m26,785s, Hamilton responds the next lap with a 1m26,523s. Hamilton majkes a mistake and slides his front tyres, and now trails Vettel by 2.9s. On lap 50 Hamilton sets fast lap at 1m26.444s. At lap 50 Vettel leads Hamilton by 1.3s, followed by Raikkonen (8.0s), Ricciardo (9.4s), Alonso (26.9s), Verstappen (27.9s), Hulkenberg (29.3s), Bottas (31.0s), Vandoorne (33.0s) and Sainz (37.8s) in tenth place. Hamilton closes once again to under one second behind Vettel. On lap 53 Hamilton drops back to 2.7s behind Vettel, and complains that his rear tyres are going off. On lap 54 Ricciardo sets fast lap at 1m25.945s. On lap 56 Ricciardo closes to a second behind Raikkonen. Across the line Vettel wins ahead of Hamilton, Raikkonen and Ricciardo.